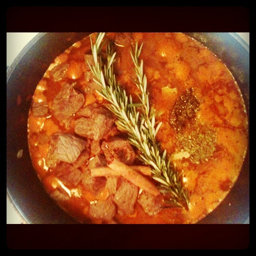 iderdider....: this beef stew will change your life. I may have mentioned that I am a tiny bit obsessed with the stunningly wonderful cookbook, Well Fed. I have made this stew three times in the short time Well Fed has been in my house and holy yum. You won't be sorry. There are a few (minor) changes to the recipe from the website to the book, but the online version looks delish too. Don't skip the orange zest, it sounds fussy but it makes the stew special. Local tip: yesterday, I picked up a 10 lb. bag of California oranges for $5 across the street from the magic Goodwill. magic goodwill?? where is this magical goodwill you speak of? :) i like $5 oranges too!